My friends and I all have children around the same age which makes it fun for us to plan outings. Each summer we do something fun and meaningful with our children. From picking apples (upcoming post) in the fall or picking strawberries in the summer. 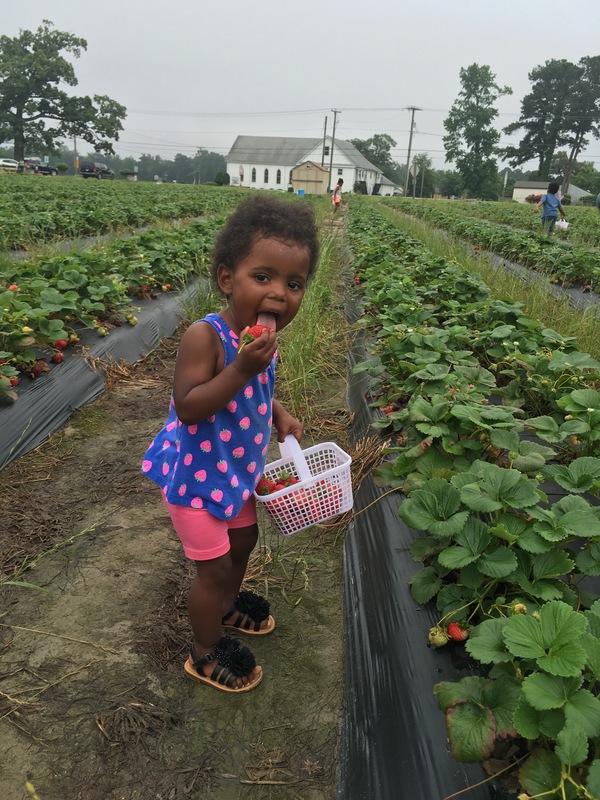 Normally, I share about places to go in RVA, but we have been going to Suffolk, VA where my friend lives when strawberry time comes around. 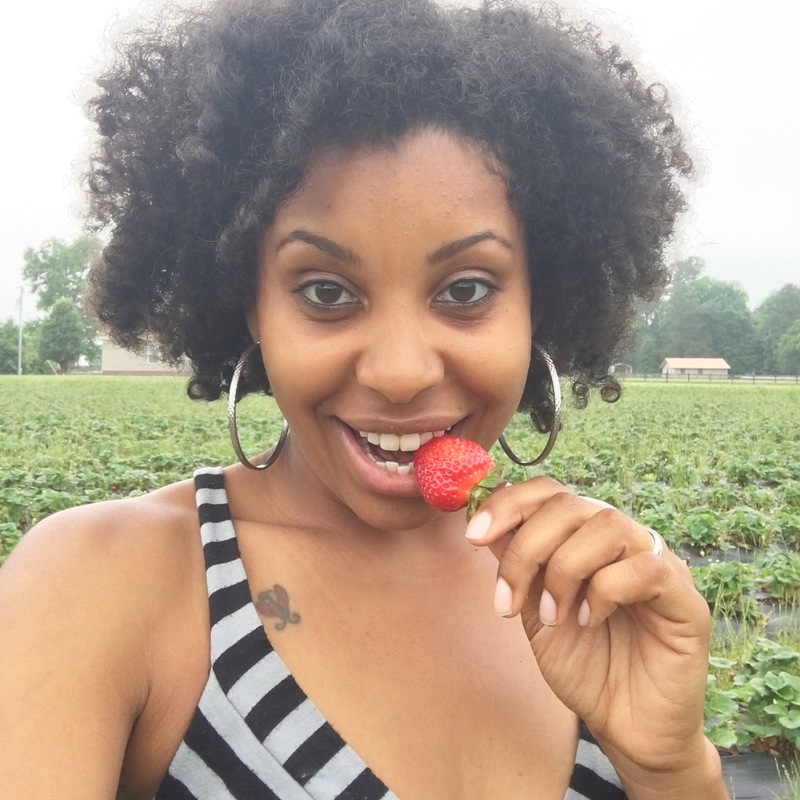 Faith Farms sells wholesome locally grown strawberries. They have a nice size farm with rows on rows of strawberries. 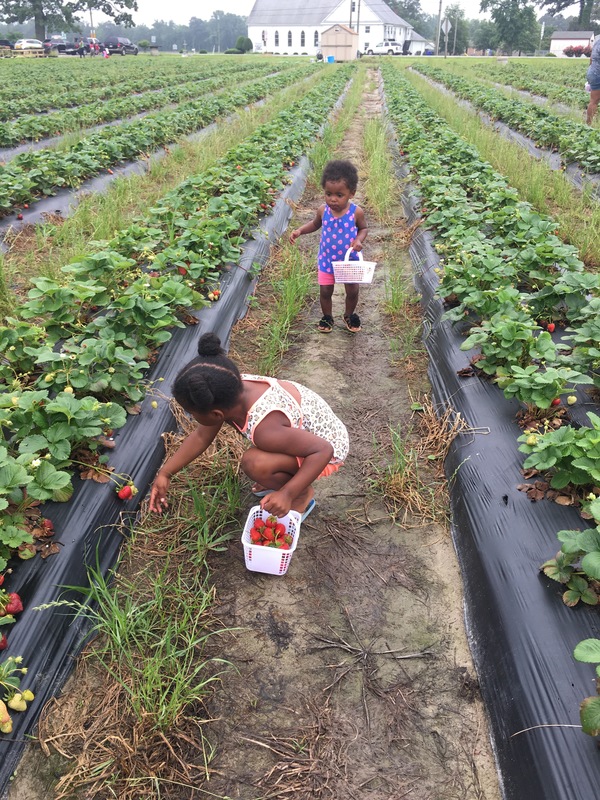 Strawberry picking is quite easy which makes it fun for children to do and if you do not have children it is still something fun to do with friends. You go search through the field for fully colored strawberries, you pick the fruit with about one-quarter of the stem attached. We always go in the morning. Morning, when the berries are still cool, is the best time for picking strawberries. With children, it is important to show them how since strawberries are delicate and can bruise easily. They have more fun if they are informed and then allowed to do it themselves. We give each of our children a basket and let them roam the fields themselves. When the baskets are all full I usually do a little inspection to ensure they did not pick any that were not ready or that were bruised. I probably should add that if you have smaller children ages 1-3, you probably will find them eating strawberries as they go. We all wish to wash them before we eat, but the little ones just don’t understand. I plan to bring a spray bottle filled with water next year, lol. After picking the strawberries, the baskets get weighed. On average it is about $7 for a full basket as in the featured photo. 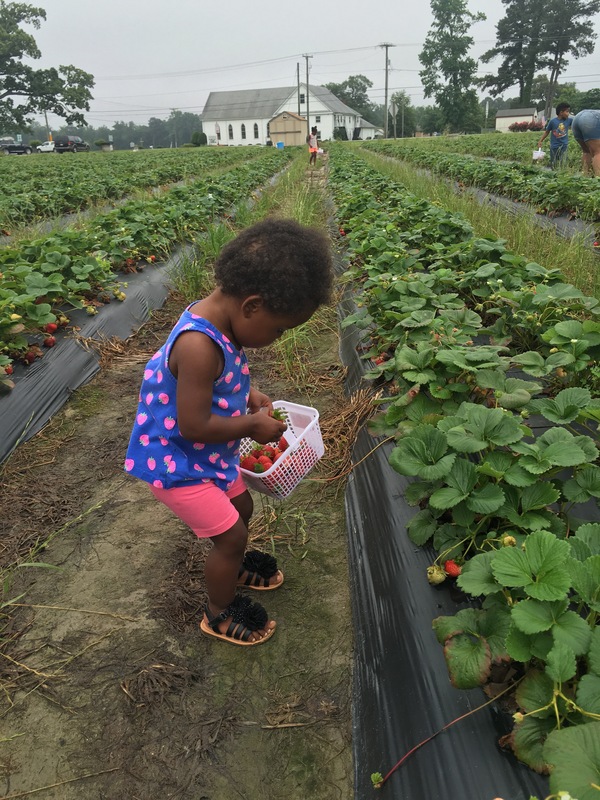 Overall strawberry picking is very affordable, fun, and healthy! Strawberries are delicious and are one of my favorite fruits. My children eat strawberries almost daily. Not only are they good to eat, but they are good for us. Strawberries are packed with antioxidants and fiber. You can add strawberries to any smoothie, any dessert, and any recipe for jam or preserves. 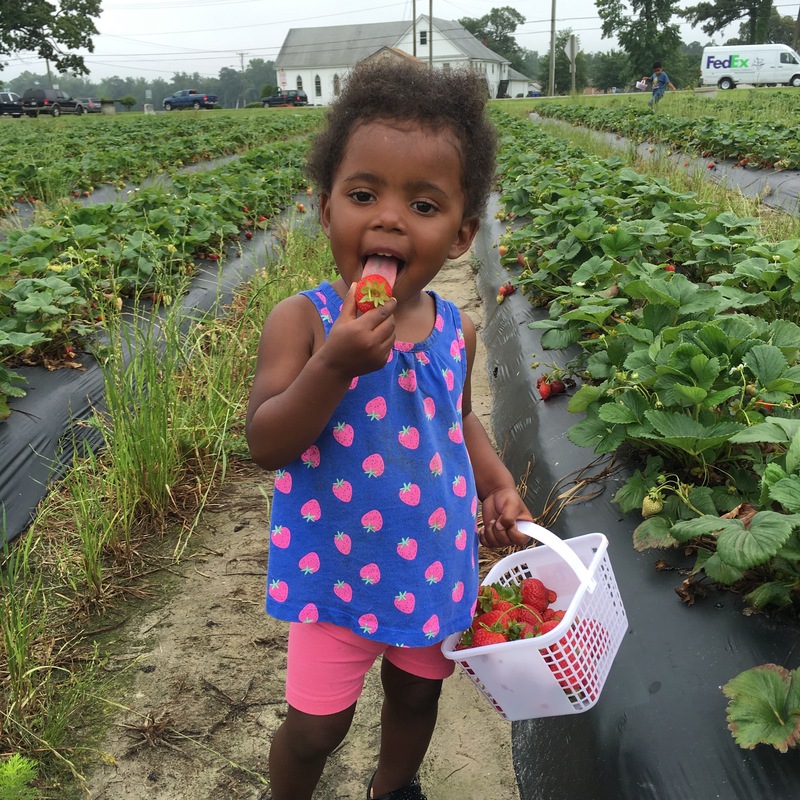 Prior to going to pick strawberries it is important to research Tips on Picking and Using Strawberries if you have never been before. Another way to make Strawberry picking fun for you and/or your children is to read about all the interesting facts about strawberrries. As a mother, I am always trying to provide opportunities for inference with my children. It is important for children to make connections and begin reasoning at early ages. This helps with their critical thinking and provides them with more knowledge so their experiences can be more meaningful. Did you know that the world produces billions of strawberries a year? If we were to count berry to berry for the strawberries just produced in California for one year it would circle the earth 15 times! Interesting, I know! This is an example of some of the fun facts I went over with my oldest daughter. After going to pick the strawberries is the best part. You already know why! You get to eat them! This is when you can decide on what great strawberry dessert you can make to enjoy the fruits of your labor, literally. This time was quite different than before. The last year we went strawberry picking we came back and made Strawberry shortcake desserts, this time the strawberries were so sweet we could not resist so we just cut the stems off and ate them fresh. Check out what I found on Pinterest Amazing Holiday Dishes you can make with Strawberries. If your interested in “Pick Your Own” fruits just google using your current location and you should find some farms near you. Vist Completely Kids Richmond and find a complete listing of the most popular pick your own destinations for Richmonders. It’s perfect that she was wearing a strawberry outfit for the occasion. Great post! Yes, I will admit that was pre planned — theme mom to the fullest.